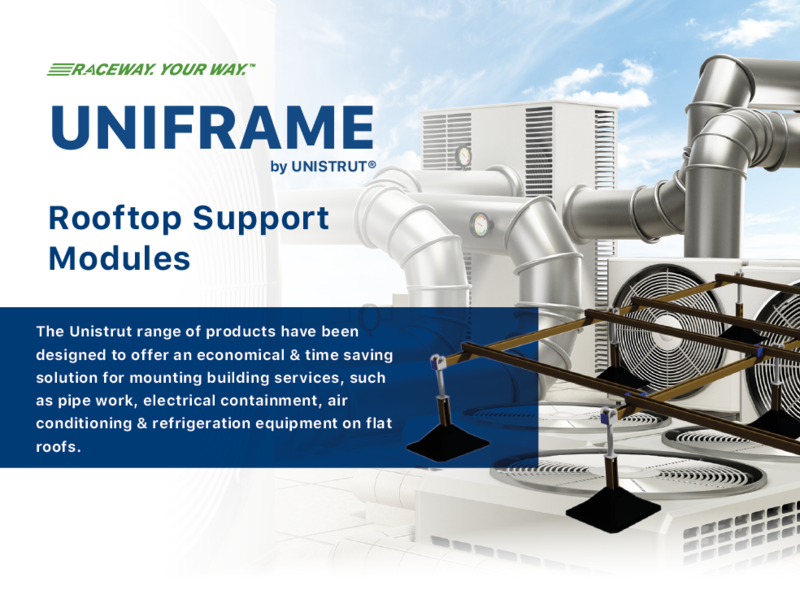 Unistrut has announced details of its latest product launch, the highly economical, flat pack rooftop support kit, the Uniframe. Designed to support mechanical systems & mounted building services on flat roofs with high, load tested, performance. The highly durable and robust Uniframe is height adjustable from 300 to 405mm and is able to accommodate all types of air handling units and supplied in kit form for easy shipping and storage. John Heaton of Unistrut commented: “This is an important product launch for us that will support our expansion into the air conditioning mounting sector. We have utilised our vast knowledge and understanding of the structural framing market and created an incredibly simple but highly effective product that will support and enhance the installation process.